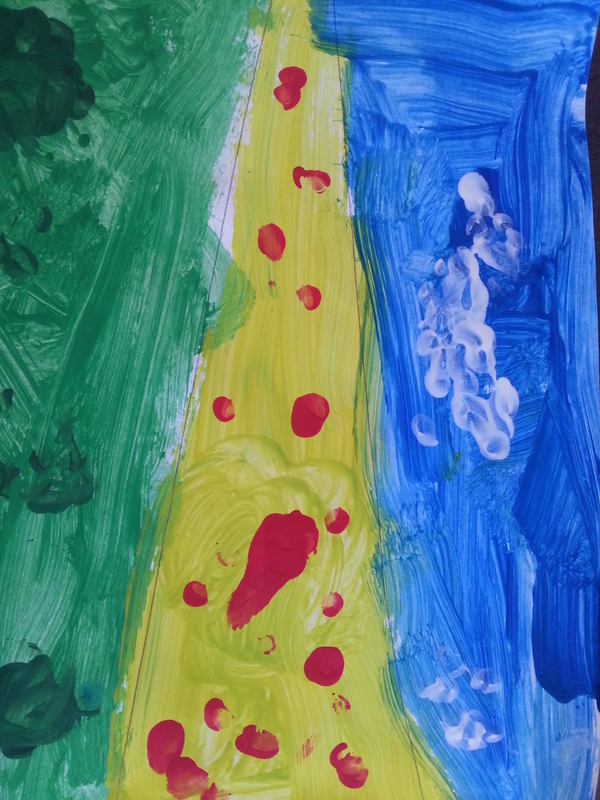 Kindergarten art, painted by my son. We’re only a few weeks into the school year, but I already realize we won the lottery with our son’s teacher this year. There are so many lovely anecdotes my son has brought home that illustrate what a gem she is. But there’s one in particular that I noticed from the first day I dropped him off at school that speak to the heart of her brilliance. Every morning, all the kids from my son’s class wait in line to enter the classroom, and there is his teacher, perched on a kid-sized chair or crouching at their levels. She greets each of her students, and connects with them and really listens to each of them. She sees them. One evening, prompted by one of the “bedtime banter” questions she emails parents to encourage conversation, I asked my son, “Show me how you listen?” He demonstrated, sitting cross-legged on the floor, hands folded, eyes wide, looking attentive. He explained to me that that’s how you listen. You listen with your ears, your brain, your body, your eyes, and your heart. I know, it sounds like something from the All I Really Need to Know I Learned in Kindergarten poem, except that I think most of us didn’t really learn this in kindergarten (myself included) or ever, to be honest. We’re constantly instructed to “listen” as kids, but we’re not necessarily told how to listen. And often, we’re not really even listened to, as kids. We may not know what it feels like to be listened to. Conversely, my son’s teacher is teaching her class how to listen and role modeling it for them. If I had to condense the learning from all the parenting books I’ve read, that’s one of the key learnings: we all want to be seen and heard. In fact, that could be extended to much of what I know of humanity. We all hopefully know the feeling and the power of being completely and thoroughly listened to, but how often do we really listen? Not just listen to what someone is saying, but connect with the person who’s talking, without an agenda, without judging or thinking about how we’re going to respond, or how it relates to our own lives. Just pure and complete, open-hearted listening. I’ve been thinking a lot about listening as I’m going through a training to become a leadership coach. Deep listening can be hard. It requires focus and energy, and forces us to quiet the chatter in our own heads. It’s forcing me to ask if/how I’m listening in my life: to my kids, family and friends, and to myself. Can you imagine what the world would look like if we all listened with our bodies, minds and our hearts? In every classroom and boardroom and waiting room and kitchen, we all really listened to each other? What would the world look like if everyone felt seen and heard? Tomorrow morning, when I drop my son off at school, I’ll marvel at how his lovely teacher checks-in with each student as she or he enters the classroom to start the day. And I’ll imagine that classroom multiplied. And I’ll imagine all those kindergarteners going out into the world and sharing their listening skills. An army of kindergarteners, changing the world through listening with their minds, bodies and hearts.